I met Anna Thomas at the 1975 Chicago Film Festival. She was not yet 30, and already the world's most famous vegetarian cookbook author because of The Vegetarian Epicure,published by Knopf when she was 24. It sold well over a million copies. Anna was at Chicago with her husband Gregory Nava and their film "The Confessions of Amans," which won the Golden Hugo as best first feature. She also wrote and directed "The Haunting of M," which I thought was a wonderful film, but is unhappily not available on DVD. Together, they made the great film "El Norte," Gregory directing, Anna producing. Their co-written screenplay was nominated for an Academy Award. She also co-wrote and produced their "My Family." Greg and Anna have become lifelong friends of Chaz's and mine, despite my rule of rarely growing close to movie professionals. It had something to do with a bowl of soup. Anna is a senior lecturer at the American Film Institute, lives in Ojai, and has continued to create cookbooks. Her newest one is Love Soup (W. W. Norton). You cannot open it without wanting to get out a pot. It was just nominated for the James Beard award for the year's best cookbook. It's not a movie, but I want only the best for my readers, so I asked her to do an e-mail interview. Q. I still recall my first bowl of mushroom soup at your table in Los Angeles, prepared from wild mushrooms Greg picked and vouched for. Do you remember that soup? A. Wow, what a memory! But I do remember it…. I had taken Greg to Poland and my relatives there took us for a long walk in the forest to show us their favorite boletus areas. When we got back to California, he joined the mycological society and became a complete enthusiast. One early spring day, foraging in Nojoqui, near the coast up north of Santa Barbara, he found an incredible amount of chanterelles – we had a pile of chanterelles on the patio table that came up shoulder high to me! And they were immense. Chanterelles are one of the most sought after wild mushrooms, so this was like having a bucket of truffles or a sinkful of caviar. I started cooking chanterelles in every possible way, sautéed, in omelets, in risotto, with pasta, and of course – in soup. So I think we had a lovely chanterelle soup that night, and a good time was had by all. But you must have had many bowls of mushroom soup before that – and I am horrified to imagine that some of them were from cans. Could it be that that one was your first mushroom soup from scratch? No wonder it was memorable! Maybe you lost your mushroom soup virginity that night! Q. I approached that vegetarian meal with such wariness, although after all I'd had many meatless meals. Why are people so stand-offish? A. I think we're just creatures of habit. People tend to be afraid of change. Now things are much different – vegetarian food is mainstream in most places I know (perhaps not Texas). But there's also the fact that at that time – back when dinosaurs roamed Wilshire Blvd – trying to get a good meatless meal was like trying to get a good coffee in England. Damn hard! (Thankfully, both areas have improved dramatically) And the people who were making noise about being vegetarian at that time weren't talking about delicious chanterelle risotto or arugula salad – they were nattering about mock meatloaf and nutritious tofu shakes and generally feeling saintly for saying no to meat, and letting the meat eaters know just how they felt about them. They were being self-righteous. Well – in my experience, self-righteousness and deliciousness rarely arrive together. So I can understand why many people were put off by the whole idea and called it a weird, fringe diet. There was a vegetarian restaurant in London for many years that was called Cranks – maybe you ate there? – because they decided to embrace the name calling and make a joke of it. I don't believe in the us-and-them thing. I look forward to the day when there is no distinction made, when the porcini pasta is not a “vegetarian meal” and Katherine Bigelow is not a “female director” – when good is good, and that's it. But these things take time. Habits only fade when they are replaced by new habits…. That's why I'm always working on delicious new recipes, new ways of making healthy eating a constant pleasure. I don't think you get anywhere telling people not to do something that they like. I believe that any success I've had in the food world has come from offering people delicious, attractive options – and then leaving it alone. Q. How did you get started on vegetarian cooking when it was far from widespread? A. I wasn't following any trends, that's for sure! Actually, I never decided to be a vegetarian – it just happened. I grew up in a Polish immigrant household, surrounded by kielbasa, but once I went off to college I found myself eating less and less meat, and then – whaddayaknow? – I wasn't eating much at all. Guess I was a vegetarian. But the label definitely followed the action. Now the cooking – that was just a matter of survival. I was so poor when I went to UCLA! I had to figure out how to get jobs, stay in school, support myself somehow… and eating out was not in the budget. So I had to learn to cook. And since I wasn't eating meat, I developed my own cooking style. It was fun. I used to buy Gourmet Magazine (RIP – can you believe they shut that down?) and read it cover to cover, and then I'd figure out how to adapt ideas to meatless meals. Or I'd just experiment with whatever I had from the market – or dip into Julia or James or Elizabeth David and then apply my own ideas…. Later, when I traveled in Italy and France and Greece, I saw that there was so much wonderful meatless food that was a traditional part of these cuisines – that it wasn't relegated to some special section of the menu, the vegetarian ghetto, but was simply part of what people always ate. That was a marvelous experience for me, and inspired me so much for the second book. Q. Wasn't your first book, "The Vegetarian Epicure," was essentially the first vegetarian cookbook devoted to gourmet or fine cooking? A. I think that might be true. And guess what – everyone likes good food! Not that I thought of it as gourmet when I was writing it. I was just writing about the food I liked to cook and eat. Remember – I was a kid. A college student. I was cooking for myself, and for my friends at school, and they'd all say, “Wow, Anna, your food is so good, you should really write a cookbook!” Of course, now I look back and realize that we were all hungry students – my friends were just so happy to get a home-cooked meal – they probably would have said that to anyone who fed them! But it is absolutely true that I was after delicious food. I liked to have a good time – you know that! I was a hedonist. Food was so beautiful, so tasty, such a pleasure when it was good… and I just didn't see any reason why it shouldn't always be good. I had stopped eating meat, but I hadn't stopped eating. So my primary goal with everything I cooked was to make it delicious, make it a wonderful experience, whether it was simple or fancy. I wanted everyone to have a good time. I still feel the same way. And I was completely uninterested in dictating to people about their diets, or criticizing them. I was just inviting people to sample some new, tasty options. I think that made my first book attractive for a lot of people who would otherwise not have touched anything called “vegetarian.” I'm sure I didn't sell a million copies only to vegetarians. Q. You got off the plane in New York and your editor at Knopf was startled to discover how young you were? A. I think it was probably a shock to Judith Jones, although she must have known I was a student. I was so naïve! I knew nothing about the book world, the food world, publishing – I don't think I had ever been to New York before that trip. That was probably the worst of all, in the eyes of the New Yorkers. But Judith was great to me, a very good editor. She taught me a lot, but she didn't over-edit, she believed that I was the new “voice” that was needed at that moment. Imagine hearing such a thing when you're 21. A. Hahahahahahaha! Oh, that was really something. I guess I really, really wanted to go to school, because I wasn't going to be deterred by the fact that I couldn't afford to live anywhere. After a month in LA, I was totally broke – I couldn't even rent a room. But I had some friends from high school who were living in the new co-ed dorm. There were separate floors for boys and for girls, and my friends were all guys. A couple of them took me in – they actually thought it was so completely exciting to do this illicit, dangerous thing – to have a girl staying in the room. They cleared the top shelf of the long closet and we put some bedding up there. At night, I'd get in my PJs and stand stiff as a board, and two of them would grab me by the ankles and the shoulders and just sort of vault me up into that shelf. That's where I slept. And various other people on that floor started sharing their meal cards with me whenever they weren't going to be using them, so I had plenty of opportunity to taste the dorm food. I was adopted by the 6th floor at Weyburn Hall! I loved those guys, they were like my brothers, but I was so glad when my student loan came through, and I could share an apartment with a bunch of girls – and have a bed. That's when I started to cook. Q. The new book is for soups. People seem more receptive to vegetarian soups than main courses? People are used to having vegetable soups, it's not a shocking idea to them. And as a rule, the appetizer course of a formal meal, which is where we have generally encountered soup, is wide open – and that's exactly why so often the most inventive and interesting food on a restaurant menu is found in that category! But my new book, Love Soup, is about more than soup – and much more than soup as an appetizer. 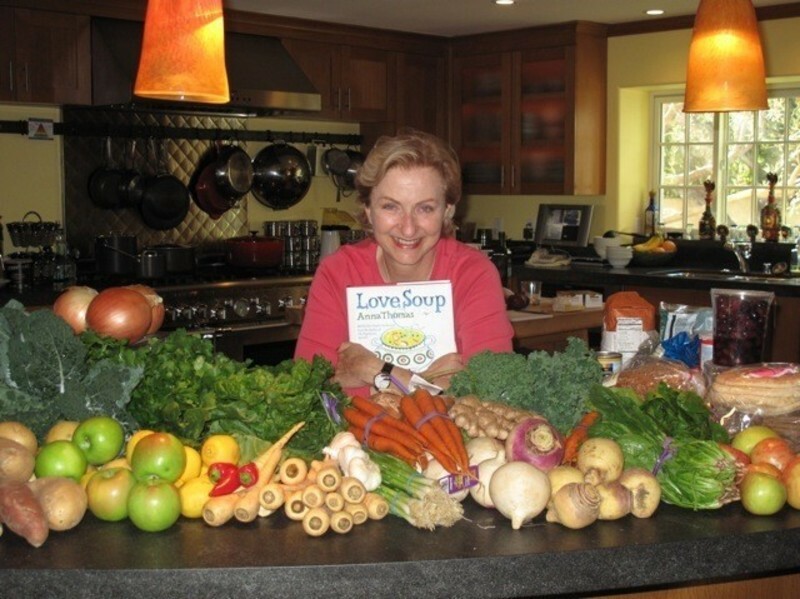 It's about what I call living the soup life – a way of eating that is simpler, but still based on fresh food, home-made food. When you're living alone, or in the middle of a big remodel and don't have much of a kitchen, or you're just busy with a million other things, there's still a way to eat wholesome, delicious, home-cooked meals – SOUP. That's what I discovered when I was camped out in the 81-inch kitchen while my house was being ripped down. I turned to soup again and again, and found I could have lovely, satisfying meals with a great, hearty soup at the center of the meal. And that's why a third of the book is devoted to recipes for breads, salads, hummus, a few easy desserts – all my favorite go-with things that make soup a satisfying, casual meal. It's a return to a simpler way of doing things. When I learned to build those casual meals around soup, I started entertaining that way, too, and the soup suppers we had in the studio were phenomenal fun. Then I did the soup tasting party with Alanis Morisette – a blast! Now a friend of mine has started a soup club in Ojai – the Gang of Soup – we get together once a month and someone cooks one or two or three soups, whatever they feel like doing, and other people bring other things in free-form potluck style… I honestly feel sometimes that it's like a movement. Hmmm… is soup a lifestyle choice, or was I born that way? Seriously, though – what could be nicer on a blustery day than a big bowl of minestrone with those wonderful, creamy cannellini beans and a big chunk of whole grain bread? Or a Green Soup with Mushrooms sprinkled with feta cheese, and a sourdough roll. I don't think people need a lot of persuading to think that sounds good. A. Well, I'm so glad you asked, Roger. Yes, many soups do adapt to your favorite kitchen item. Soup is the easiest food in the world to make, that's why it's such an egalitarian thing – good food can be for anybody, home-cooking can be for anybody, healthy food can be for anybody – and there are soups that can be made just by putting everything together in one pot and simmering till done. However – there are a few more things to know about cooking, things that can elevate your soups from good to great. As I endlessly repeat, the most important thing is to start with good, fresh ingredients. But then -- there are a few techniques I use to develop maximum flavor in those good ingredients. Many of my soups start with a well-caramelized onion or two. The slow cooking of that onion in a bit of olive oil, that's magic. The onion turns to marmalade, and the flavor is deep and rich. Same onion, but a whole different world of flavor. Sometimes I toast spices for a moment or two, then grind them. Freshly toasted cumin, ground and tossed into a black bean soup or a lentil soup -- wow. And here's a great one: take a basket full of homely root vegetables, those stalwarts of the winter season like potatoes, carrots, turnips, parsnips…. Add a few onions… cut them all up in pieces, toss with some good olive oil and some sea salt – and roast in a hot oven for an hour or more. You will be amazed at the flavor that those plain jane vegetables develop! Then use them in soup, in risotto, in salad, or just eat them by the bowlful as they are. And while the oven is on, why not cut up some day-old bread and make those excellent home-made croutons? And what about that great thing, the home-made broth? It's dead easy to do, but you need a big mother of a stockpot. These are techniques that require a sauté pan or an oven or a mortar – sometimes you do need something besides the faithful Rice Cooker. Q, What has really changed in the vegetarian world since you were starting out? Farmer's Markets? The farmers' markets have changed everything, not just vegetarian cooking. What a transformation they have made in our day to day food culture! Even the many people who have never shopped at a farmers' market benefit from them, because every supermarket and grocery store has had to step up its game as a result. People have much higher expectations now, and know more about lots of interesting produce. Just the other night I was sitting around with some friends and we were talking about farro – actually we were chowing down a delicious farro salad – and someone wanted to know what was farro and why was it suddenly turning up everywhere? Well, farro is actually an ancient variety of wheat, making its comeback. Then someone reminisced about when nobody had heard of arugula, and it was the big new thing. Yes, there was such a time. The point is – everything has changed. There is an abundance of great, interesting produce available, there is ever greater consciousness about the importance of fresh food, and of eating seasonally and as locally as possible, people everywhere are more sophisticated. And the vegetarian world is now part of the mainstream food culture where I live. I think that's probably true in many parts of the country. I know that in California I can go to pretty much any restaurant and find something to eat on the menu. Probably something good, and without making a fuss. Hey – I even managed in a steakhouse in Chicago with Chaz! When I was invited to do a vegetarian Thanksgiving menu for Gourmet magazine about 10 years ago, I knew that things were really, really different. Now, it's the vegans who are the cutting edge, and they talk to each other all the time on the internet, blog like crazy, exchange recipes over the big backyard e-fence. Q. Will I live longer if I'm a vegetarian? A. Well, Roger, that depends what else you're doing. You know as well as I do that the main thing about longevity is to get lucky with your genetic starter kit – and then don't do too much to screw it up. But I think I can fairly say that other things being equal, yes, it's a healthier diet. Q. One review said your book would charm even carnivores? Why are we so obsessed with meat? A. Hey, can we all just get along? Q. What is the most delicious soup in your book? Come on, now. The one you would serve to the Obamas? Roger, how can I choose a favorite from among these soups? They are all my favorites, they are all delicious! There's a whole section in my introduction about this. It's called, What Is The Greatest Soup? And it's really about how many things can make this particular soup the best one for this particular moment. What is the season, what is the weather, what is the occasion, what is your mood? Who made that soup? Can you imagine how I feel when one of my sons makes a soup for me? Right there – that's my favorite soup! It has to be. OK, OK. The Obamas are coming for dinner. Christmas Eve Porcini Soup – utterly simple, yet utterly fabulous. Or maybe Green Soup with Mushrooms, favorite of rock stars – and a favorite of mine, as well. (I actually have a whole chapter on the green soups, it's become a cult.) And for dessert we would have Cold Cherry and Lemon Soup. Eat it and fall in love. Q. How did Teddy and Christopher relate to vegetarian meals as kids? What did they tell their friends? They were fine with everything because I didn't force them into any particular diet. They were carnivores, then they went through periods of not eating meat, then they went back to being carnivores, and then…. You get it. I just kept offering them tasty, fresh food. They liked it, and so did their friends. In fact, at one point Teddy was going through a phase when he refused to eat anything I cooked, politely but consistently. (He now admits this was tedious rebellion) But his friends would come over and eat up all the Green Soup – they'd ask for it! He was mortified. But what to tell their friends? This did not ever come up as a problem. Q. What is the most common weakness of people who alter a vegetarian soup recipe (apart from sneaking in animal protein?). A. I think leaning on things like bad packaged vegetable broth, or (horror!) bouillon cubes or powders – that can really ruin a soup. (I use a canned broth sometimes – but only one brand. And yes, I name it in the book – Swanson's, the inexpensive one at the supermarket.) But other than that, I think the same ideas apply to soup that apply to all cooking: start with good ingredients, cook mindfully, use your taste buds. And use common sense. If you are making, for instance, Potato and Roasted Garlic Soup, and you find that you don't have any garlic on hand – for Pete's sake, make another soup. Soup is very flexible and adaptable, and you can make all sorts of substitutions, but don't try to get around a main flavor component. And by the way, sneaking in an animal protein won't ruin a soup at all – it will just make it into something different, but if that's what you want – go for it. I am not here to make rules, except this one: when you think your onion is caramelized, keep cooking it slowly for another half hour. You will thank me. Q. Where do you stand in the great tofu debate? A. Hmmm. What is the great tofu debate? I like tofu when it's good, and well prepared. I've had wonderful tofu dishes in certain Japanese and Chinese restaurants. I don't use tofu as a substitute for other things, if that's what you mean – I don't “hide” it in casseroles, and so on. But you know my style – I like things to be what they are, not imitation versions of anything else. In fact, I don't cook with tofu much, although I enjoy it when I'm eating out, because I don't do a lot of Asian style cooking. It's just not my corner. But now Teddy makes delicious tofu scrambles sometimes, and I always have some and they rock! So – what is the great debate?